I normally don't read political books, but I saw this one available as a Kindle edition for only $3 and decided to get it. Despite the title, it is a reasoned argument, which tries to show that our current economic stagnation is a result of more and more wealth being accumulated by a smaller and smaller segment of the population, decimation of support the the middle class (i.e., education and social programs) and control of the political process by the very wealthy. His basic argument is that between 1950 and 1980, taxes were high compared to now, especially on the wealthy, yet economic growth was robust. After 1980, taxes were repeatedly cut, with this promise that this would unleash even greater economic activity. Instead the economy got weaker, and this weakness was taken as justification to cut taxes even further. Reich ends with a prescription for the future. He says the US will only prosper if a popular revolt restores taxes and social spending to pre-Reagan levels. I find his arguments generally persuasive. The main weakness as I see it is that restoring post-war US policy will not restore the world to post-war configuration. The US didn't used to have as much competition from overseas as it does now, and it is not obvious that the race to the bottom that we are now dealing with can be avoided. nut-job wrote: I find his arguments generally persuasive. It impresses me that he is willing to say that we will need a popular revolt to rectify this, which I have long suspected is true. Of course, no one wants to hear that they are going to have to take to the streets to preserve the hopes and the future of themselves and their children against a rapacious oligarchy--civilization is supposed to be past that point. Here is someone who has written a book with the opposite opinion: That everything is just wonderful for everyone because of the circumstances that concentrate super-wealth (warning, this interview is long). Now take your average reasonably educated hanger-on from the former middle class. Which one is he going to want to believe: The guy who says you'll have to revolt, or the one who says everything really is for the best when we are being sucked dry, so you can just relax? And perhaps in the answer to that question lies the reason that Romney is ahead of Obama among independent voters by a cool ten percent (who do not include Lenny, thank goodness). jbuck919 wrote: It impresses me that he is willing to say that we will need a popular revolt to rectify this, which I have long suspected is true. Of course, no one wants to hear that they are going to have to take to the streets to preserve the hopes and the future of themselves and their children against a rapacious oligarchy--civilization is supposed to be past that point. Here is someone who has written a book with the opposite opinion: That everything is just wonderful for everyone because of the circumstances that concentrate super-wealth (warning, this interview is long). Now take your average reasonably educated hanger-on from the former middle class. Which one is he going to want to believe: The guy who says you'll have to revolt, or the one who says everything really is for the best when we are being sucked dry, so you can just relax? And perhaps in the answer to that question lies the reason that Romney is ahead of Obama among independent voters by a cool ten percent (who do not include Lenny, thank goodness). I'm not sure the popular revolt requires literally taking to the streets. I just might require openly voting for (gasp) liberals. What shocks me is that 'liberals' have given so much ground, and embraced centrist/right positions. When will unabashed liberals emerge? The book ends with a series of challenges to Obama. Things like letting the Bush tax cuts expire, forcing banks to reduce the principal in underwater mortgages, imposing strong regulation of banks, including limiting the size of banks and making it illegal for banks to speculate with the assets of their depositers, increasing spending on education and infastructure. Why is it unthinkable to do the things we did when the country was so successful economically? by what basis can someone with an ounce of intellectual honesty make (or believe) such a specious argument? like tax policies in the 1950s were responsible for the growth or the fact that the US was the only major developed economy that wasn't destroyed by the war? its the worst sort of demagoguery to claim that economics can validate these idiotic blue / red arguments. I remember Reich arguing 20 years ago that we should all adopt the Japanese model as they clearly had figured out how to have the government cooperate with business. The truth is that our economic problems - the stagnation of middle class wages, increases in inequality etc. are mirrored across the developed world and are a direct consequence of the rise in competitiveness of Asia which put a couple of billion of hardworking people into the modern economy. BWV 1080 wrote: by what basis can someone with an ounce of intellectual honesty make (or believe) such a specious argument? like tax policies in the 1950s were responsible for the growth or the fact that the US was the only major developed economy that wasn't destroyed by the war? its the worst sort of demagoguery to claim that economics can validate these idiotic blue / red arguments. I remember Reich arguing 20 years ago that we should all adopt the Japanese model as they clearly had figured out how to have the government cooperate with business. The truth is that our economic problems - the stagnation of middle class wages, increases in inequality etc. are mirrored across the developed world and are a direct consequence of the rise in competitiveness of Asia which put a couple of billion of hardworking people into the modern economy. Well, since I'm an 'idiot' and don't have 'an ounce of intellectual honesty,' it's clear that you're not interested in my response to your statement. Where did I get the notion that you can have a reasoned discussion on the internet anyway? We've treaded into Pub territory, which may have been inevitable given the topic of the book in question. I did at least make an effort to cite another book in my first response. Reich's point, which Steve finds questionable, is nothing new. Steve's explanation may also not be new, but it is the first time I've heard it. Socioeconomic phenomena often have multiple or complex explanations, though I am afraid that the first thing Steve's notion reminds me of is the claim, which was common in an armchair way at the time but has largely been buried in the popular recollection, that women entering the workforce depressed the labor market for men. There may also have been some slight truth in that, but it was not adequate as an explanation of the dynamic in a labor market that continued to be generally favorable to men (and women) as long as the economy was doing well. Here is another piece, not entirely wonderful I admit, which anyway does not contradict Reich, and which might help get us back on track and off the one of annoyed responses perceived as personal attacks. Oh, and I've reserved Reich's book at the library. As the Occupy Wall Street protests swell in size and people pay closer attention to the gap between the wealthiest Americans and everyone else, one question is why this divide even matters. One way to look at income inequality, after all, is that it’s no big deal. If a country is growing at a healthy clip and everyone is steadily getting richer, then it’s hardly an outrage that a few titans at the very top are doing freakishly well, right? But a recent study from the International Monetary Fund suggests that this conventional view is misguided. 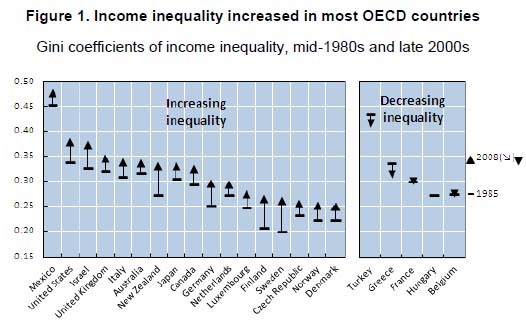 Excessive income inequality, the authors find, can actually inflict a lot of harm on a country’s long-term economic prospects. In the IMF’s Finance & Development magazine, the authors, Andrew Berg and Jonathan Ostry, summarize their recent research (see also Josh Harkinson’s piece for Mother Jones). It’s relatively common, the authors note, for countries to experience small growth spurts here and there. But sustained, long-term economic growth, of the sort that the United States and Britain enjoyed after World War II, is rare. Plenty of poorer countries — say, Brazil or Jordan or Cameroon — don’t ever seem to be able to maintain that momentum. What’s more, inequality can foster political instability, which discourages investment. Berg and Ostry also argue that inequality makes it harder for governments to deal with external shocks — it’s politically dicey to, say, cut public spending to avoid a debt crisis when the middle class already feels like it’s falling behind. Do these lessons apply to the United States? They might. In 2005, Ohio State University’s Mark Patridge conducted a study of economic growth in the 50 states and found that “a more vibrant middle class… increased long-run economic growth.” In Democracy earlier this year, David Madland tried to tease out the causality, arguing that societies with less inequality and a stronger middle class tend to have more trust, less corrupt governance and stronger “capitalist values” that encourage entrepreneurship. America isn’t the only rich country dealing with a rise in inequality. Most of the developed world is, too. A new report from the Organization for Economic Cooperation and Development finds that most of its member countries have seen their richest citizens get much, much richer in the last few decades, leading to a widening income gap. Source: OECD Income Distribution and Poverty Database. Note: Data for mid-1980s refer to early 1990s for Czech Republic and Hungary. Today, across developed countries, the average income of the richest 10 percent of the population is about nine times that of the poorest 10 percent, with much bigger multiples in Israel, Turkey, the United States, Chile and Mexico. In these last two countries, the income ratio is 27 to 1. So what accounts for the growing gulf? Changes in capital income — which primarily affects wealthier people — have contributed to rising inequality, although the impact has been relatively modest when compared to changes in labor income, the report says. As lower-paid workers have seen their incomes stagnate or even fall, the highest-paid workers have gotten steep raises. Many factors have contributed to the rising labor income inequality. Globalization has had an impact, as rich countries have been sending more of their commodifiable, generally less-skilled jobs offshore, which has displaced many lower-paid workers in rich countries. Source: Organization for Economic Cooperation and Development. Note: Paid workers of working-age. Mid-2000s refer to 2000 for Belgium and France. Mid-1980s refer to early 1990s for Austria, Czech Republic, France, Greece, Hungary and Ireland. Technological improvements have also disproportionately benefited the pay of high-skilled workers. Regulatory changes, like loosening protections for temporary (and less-skilled) workers and lower unemployment benefits, may have also had an effect. The report notes that changing courtship patterns may also be contributing to the widening income gap. Over the years people have become more and more likely to marry mates who have similar incomes. “Today, 40 percent of couples in which both partners work belong to the same or neighboring earnings deciles, compared with 33 percent some 20 years ago,” the report says. Surely to some extent this has to do with more women having earnings, period, and therefore having more women’s earning matching what their husbands make. But in any case if poor marry poor and rich marry rich, that magnifies the income gap effect. After all, if poor married rich, the result would be more evenly distributed wealth.